Determining your speed without GPS. Robert Reeder is a 1,600-ton master in the Seattle area. He drives passenger ferries for a living and drives tiny little sailboats for the pure, unbridled fun of it. 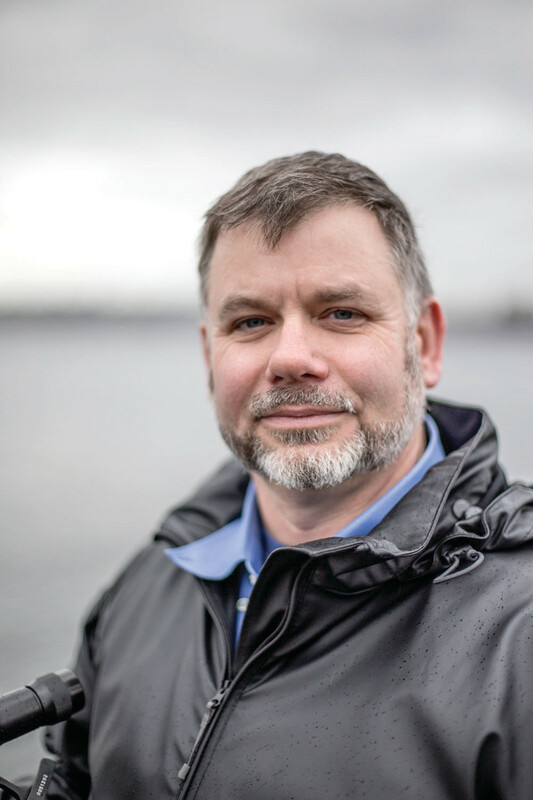 Robert teaches U.S. Coast Guard-approved licensing courses and hands-on maritime training in navigation and weather at various schools for professional mariners. He also teaches navigation and weather courses on occasion at TrawlerFest. 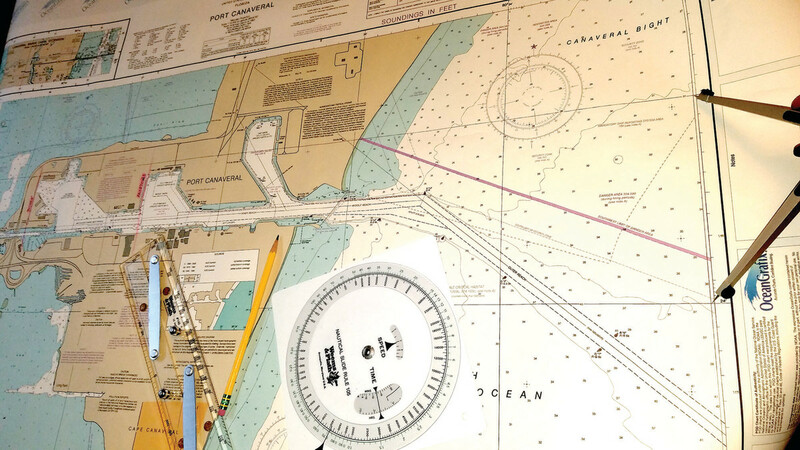 In our last installment we discussed the basic techniques of ocean and coastal dead reckoning, which is determining our location based on our course and speed since the time of an earlier known position. 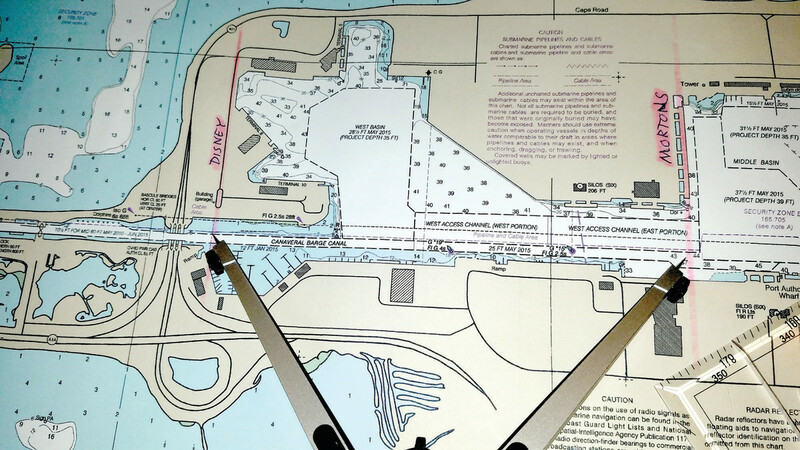 In this installment we will discuss how to obtain our boat speed in the absence of GPS. 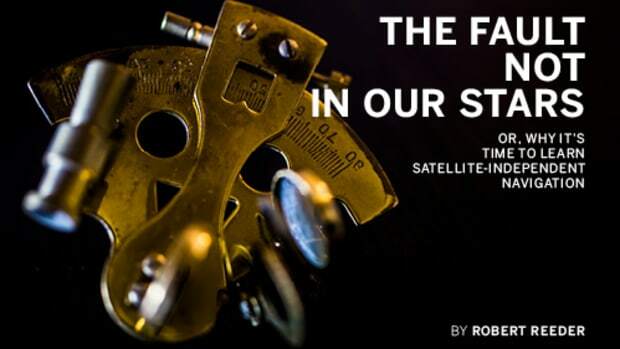 GPS speed, meaning Speed Over Ground (SOG), is a measure of our total speed over the surface of the earth, regardless of how that speed was accomplished, whether from our own propulsion, wind, currents, or any other source. Speed Through the Water (STW) is only the speed of your boat relative to the moving medium of the water. 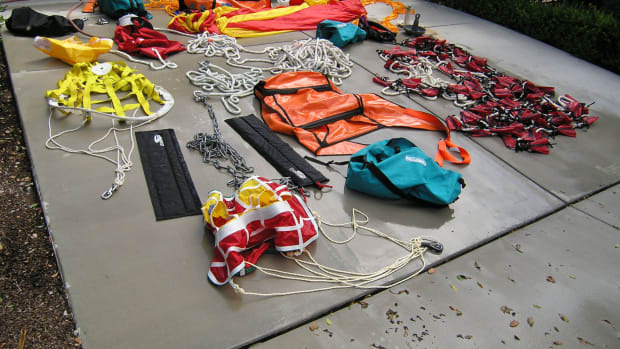 For example, imagine that you are floating in a barrel in three knots of tidal current. Your SOG would read 3.0 knots, but your STW, however derived, would (always) be zero, no matter how fast the currents are running. 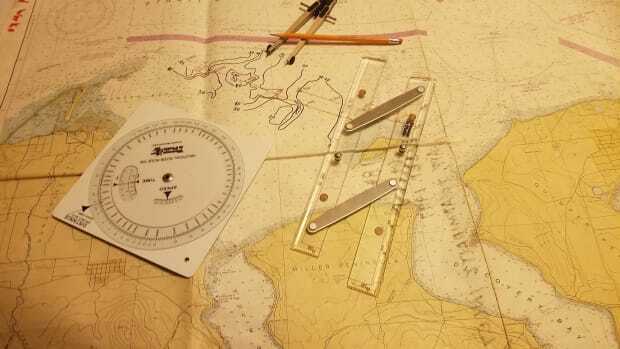 For dead reckoning (and many other navigation applications) we must use STW rather than SOG, so even with an operational GPS, we need to be able to derive our STW. Here are several means of determining Speed Through the Water. One easy way to determine your speed through the water is with a tranducer that calculates speed, like this Simrad B744V Depth/Speed/Temperature Transducer. 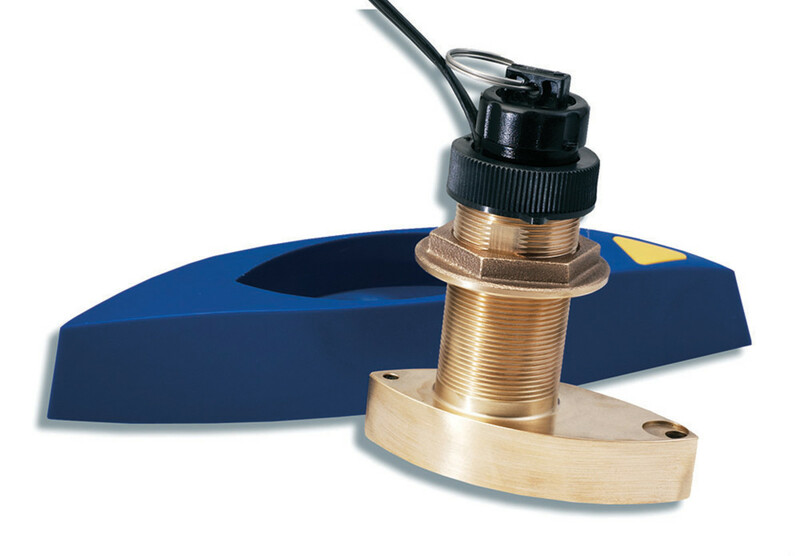 For a cruising trawler, the simplest solution is to have an electronic transducer that tells us our STW. 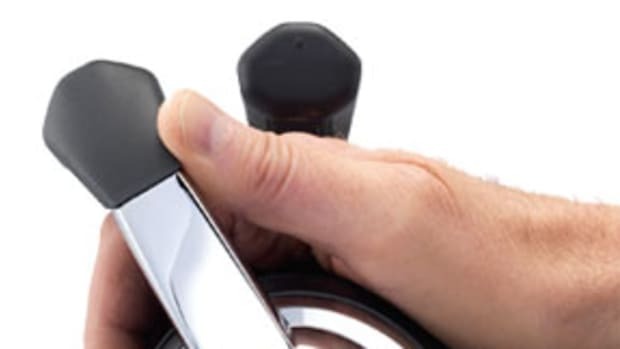 There are stand-alone speed transducers, but for a few hundred dollars you can get an all-in-one depth, speed, and seawater temperature transducer. 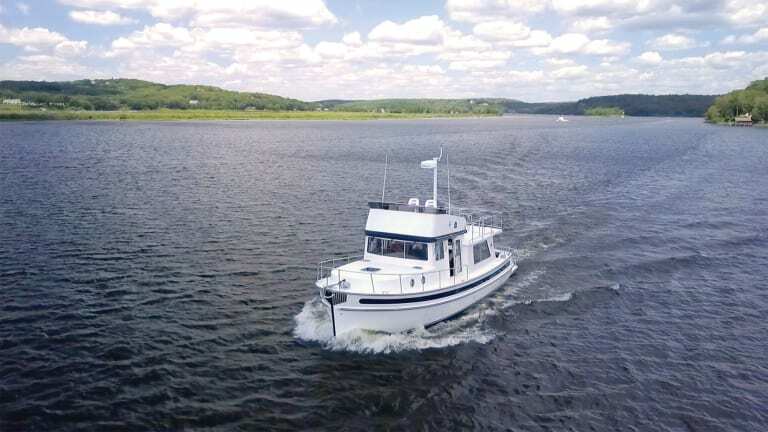 There really isn’t much more to say about this one; it’s plug-and-play, completely independent of GPS, and a superb investment for any cruising boat. For a full-displacement (non-planing) hull, the formula for boat speed in knots is 1.34 x the square root of the waterline length in feet, or 2.43 x the square root of the waterline length in meters. For example, the waterline length of my boat is 25 feet, so the square root of that is 5, which is multiplied by 1.34, equalling a hull speed of 6.7 knots. Which is about right. Hull speed is essentially the theoretical maximum speed that a displacement-hull vessel can make; things like draft, hull shape, and cleanliness will determine how much power is necessary to attain that theoretical speed. 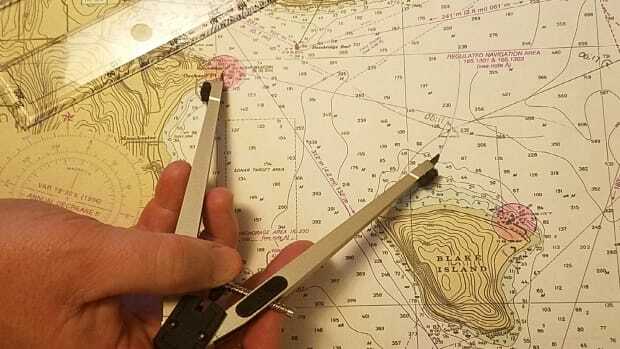 For purposes of navigation, this is useful only when running at full speed, but it is a good starting point and maximum for considering the following techniques. 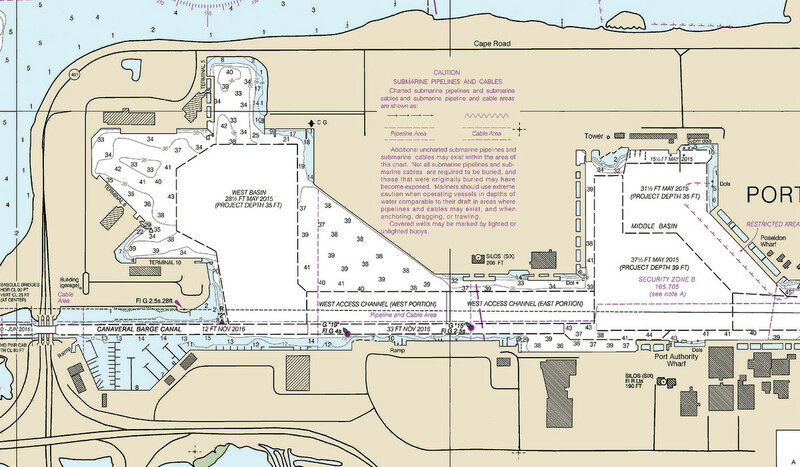 Once upon a time, heavily traveled shorelines were dotted with Measured Miles for determining a vessel’s speed. They were drawn as two parallel sets of range-marker towers on shore, set precisely one nautical mile apart. A ship ran the distance between the two sets, and from that was able to determine their Speed Made Good (SMG) for the duration of that mile. In order to correct for the effects of currents, the ship would run back and forth along the measured mile several times, and then divide the total time of the runs by the number of runs. This gave the skipper a best estimate of STW at a given shaft rpm. For our purposes, one run on each leg is sufficient; the more runs we do, the more the speed of the current will change, so we will actually start to lose accuracy by trying to collect too much data. If you happen to be near one of the remaining Measured Miles, by all means take advantage of it. Otherwise, any parallel sets of natural or artificial ranges will work. They don’t even have to be an even mile, as long as you know the actual distance between. 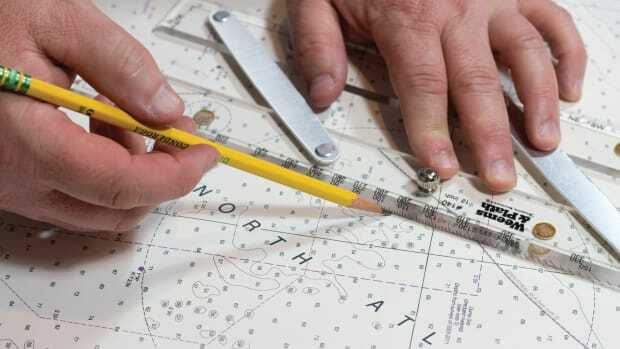 The easiest way to set your dividers to a nautical mile is to measure out a minute of latitude. One minute of latitude will always equal one nautical mile. For this example, my natural ranges were a charted road and a wharf, both of which happen to run due north and south, perpendicular to a harbor channel which runs due east and west. The two ranges are almost precisely one nautical mile apart, which is ideal for this example, but you may or may not be so fortunate in the real world. We can use the “60 D Street” mnemonic to remember the equation for determining our boat speed. For each run I want to be up to full cruising speed before I cross the first range, and to remain at that speed until I’m past the second range before I slow and turn to run the reciprocal course. Any watch with a second hand will work for this, but a good stopwatch or smartphone with a stopwatch function is really helpful. I will round my times up or down to the nearest six-second interval (tenth of a minute) to simplify the math. My first run is westbound, 8 minutes and 12 seconds, or 8.2 minutes. 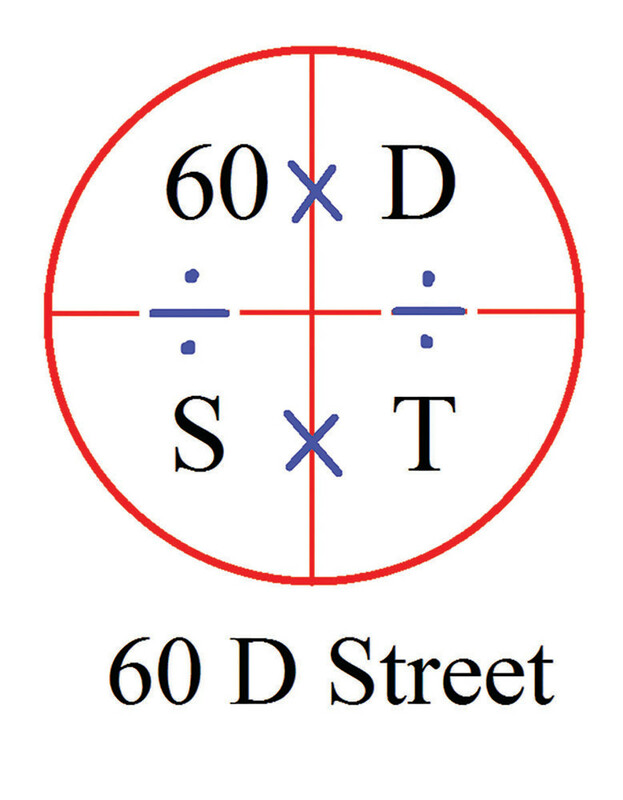 Using the “60 D street” formula (60 x Distance in nautical miles / Time in minutes and decimal minutes = speed in knots), 60 times 1.0 nautical miles is 60, divided by 8.2 is 7.3 knots. My second run is eastbound, 6 minutes and 36 seconds, or 6.6 minutes. 60 times 1.0 = 60 divided by 6.6 is 9.1 knots. Then I need to average these. 7.3 + 9.1 = 16.4 knots, divided by two = 8.2 knots Speed Through the Water. The same technique can be used even in open ocean, if you still have a functioning GPS. At a particular rpm, record your SOG, then run the reciprocal course and do likewise, then average your SOGs for a rough STW. This technique can be used to determine your STW at any rpm, data which could prove valuable in any number of situations. 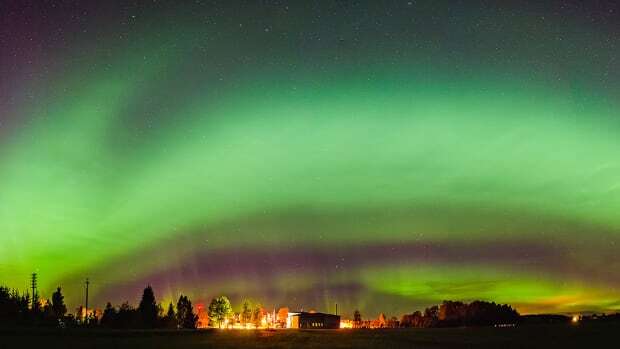 This technique will yield a far less accurate STW than any of the aforementioned methods, but if it is all you have, it’s better than nothing. As you come up on a piece of driftwood or anything else floating (not anchored!) in the water, using a wristwatch or stopwatch count the number of seconds it takes to pass the object, from bow to stern. For example, my boat is 26 feet long. I see a small stick floating in the water ahead of me. My boat passes the stick, from bow to stern, in two seconds, which means I am traveling at 13 feet per second. One foot per second is 0.6 knots, multiplied by 13 feet equals 7.8 knots STW. The same example in metric; my boat is 8 meters, and I pass the stick in 2 seconds, meaning I am traveling at 4 m/s. One meter per second is 1.9 knots, multipled by four meters equals 7.6 knots STW. Note that our derived speeds are not precisely identical, because 26 feet is not exactly 8 meters. Savvy navigators will also note that this is a bit faster than my probable hull speed, likely due, in part, to my inability to measure time precisely in units less than seconds. In this particular case, assuming a full-displacement hull, I would always default to my calculated hull speed if it were the lower of the two. Now, in addition to knowing where we are, we also have a pretty good sense of how fast we are going. With apologies to Heisenberg.